Various styles of Silver earrings with semi precious stones and Swarovski crystal, for pierced ears. The popular Threader earrings are a comfortable and easy to wear style, with an ultra-thin 5 inch Silver chain which is simply threaded through the piercing hole. Only a full length image for J104 is shown, but this is the style for all earrings J104 - J109. The chain can be left to dangle at any length. These earrings can also be used creatively with multiple piercing holes...weave the chain from the front, and add a bead before the second threading. I have used different combinations of Swarovski Crystal bicones, but the order on each pair can be changed by sliding the beads off the chain and rearranging. The combinations are almost endless, as each pair could have just 1, 2 or all 3 beads in any colour combination...I've come up with at least 15 per earring. All those 'pairs' for £5.50! There are currently 12 earring styles on this page. These are very simple earrings to wear. then let both sides of the chain dangle at your chosen length. The order/number of the beads can be varied quite easily by sliding them off the chain. 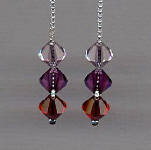 Seen here with Swarovski Crystals in Amethyst, Black Diamond and Violet. See further thumbnail images for other colour combinations. China Jade beads and tiny Silver spacers, on silver wires. These earrings match necklace (J62). These pretty earrings, with Silver wires, match the necklace (J60) perfectly. Silver Chakra hoop earrings with a hanging length of just over 2inches. Hematite, Carnelian, Tiger eye, Green Aventurine, Sodalite, Turquoise and Amethyst. Sodalite and Turquoise Silver post earrings with a hanging length of approx. 0.75inch. African Jade and Chinese Jade earrings with Silver wires. Hanging length approx. 1inch. Sky Quartz earrings with Silver wires. Hanging length approx. 1inch.